Setup Area: 15x15 foot level area is needed for setup. 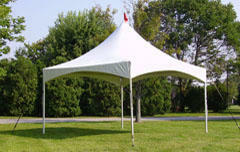 For hard surfaces such as concrete, we use concrete weights or water barrels to secure tent. Additonal charge may apply to hard surface setups due to weighting requirements.